Tammy365: Would Jesus Wear a T-Shirt? 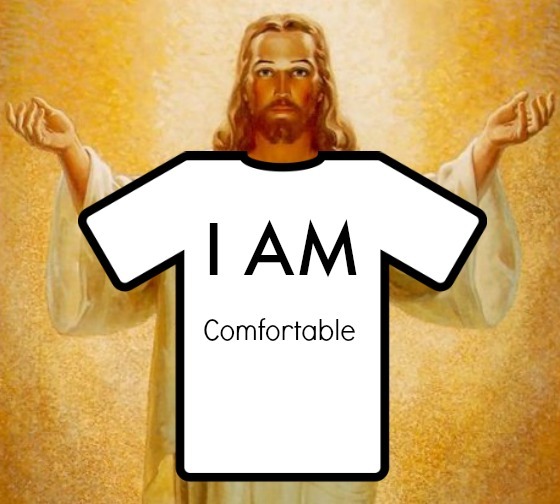 Would Jesus Wear a T-Shirt? My memoir, Labeled by Humanity, Loved by God was published in 2010. Since that time, I've shared my testimony with civic groups, church groups and just about anyone who will listen. Marketers tell me I need a brand. I have a brand new me through Jesus so I'm not sure why this is needed. But, to fit in with today's marketing, I came up with several but the one that sticks with me is....T-shirt Tammy and her Testimony! (Thanks Jan McNeill for helping finalize the brand!) Didyou think why? I'd love to tell you. I believe Jesus would wear t-shirts. T-shirts would be the fashion statement of Jesus if he walked the earth today. T-shirts are comfortable, modest and cool. They usually display a written message. As a matter of fact, I wore a t-shirt to church this past Sunday. I didn't feel like I was dressing down for worship because Jesus accepts me just as I am. He is the Great I Am! The thing I find special about a t-shirt is its shape. When you place your head and arms in, it resembles a cross. You are basically wearing the symbolism of Christianity! I wear a t-shirt every day. They suit me. I look best in one of them. So my brand may someday be: T-Shirt Tammy with a tagline of "Clothed in the Cross". Do you like it? Make me happy and take the survey to the right side of this blog. Brands and taglines really aren't that important in God's plan. Getting dressed up to go to church or other places doesn't impress God either. Yes, I know Jesus would wear a humble cotton t-shirt if he were to physically show up at church this Sunday. I'd have one on too. I hope he'd walk over to me and say "Bless you child. You're clothed in my righteousness inside and out!" Jesus gets me.